The City of Kelowna is holding public consultations in an effort to re-imagine what the Capri-Landmark area will look like in the next few decades. This week I was invited to speak at one of the workshops about my perspective on active transportation. Essentially, I gave the same talk that I did at OnPoint last year when I argued that car ownership is merely cultural and that it can and should change (and of course I plugged OGO carshare, as always). But I did give it a little twist, focusing on the relationship between culture and infrastructure, and also tried to inject some urgency into the issue. Urban Systems rounded out their series of workshops on housing, the economy, and climate with their fourth and final workshop on Transportation. The evening focused on thinking about how transportation could enable vibrancy in the community. I shared the panel with autonomous vehicle enthusiast Joseph Hlady and Lisa McIntosh, one of the founders of Urban Harvest Organic Delivery. You can read a bit of a roundup of each of points of view in the Kelowna Capital News. As you can see, there was a bit of diversity on the stage. Lisa McIntosh was closer to my position of less car usage overall, but Joseph Hlady went a completely different direction. He painted a wondrous if ambiguous future of autonomous vehicles providing last-mile transportation support to the elderly and disabled. His vision had people using automated rideshare, rather than purchasing their own cars. Of course, he neglected to say what international venture-backed behemoth would inevitably own these vehicles. He argued from the perspective of efficiency, how automated cars would mean less vehicles on the road, and from safety (less auto accidents) and accessibility. To me, this came off as just arguing for a more efficient version of the terrible system we already have, rather than a more radical vision of what we need. Joseph argued against light rail and other forms mass transit, and actually argued that AVs would allow Kelowna to remain spread out. This floored me and many people in the audience. We just spent the last 3 sessions of OnPoint talking about YIMBYism, and the need to densify. A future of every individual being whizzed around in little tin cans is exactly the opposite of what I argued for on stage. My position is that we need to abandon car culture, the real cause driving our current disastrous environmental, economic and social transportation system. Event: OnPoint – Do we need a new relationship with transportation and mobility in our region? What are the possibilities for city beyond transportation? How do we think about transportation in terms of making a city more vibrant, rather than a deadening concrete grid where we travel isolated in our cars? Although it was a bit of a slog, I enjoyed the ideas presented in his book Rebel Cities, and have continued to think about how I as a citizen can play an active role in the shaping of my city’s development. Thus, I was very excited to welcome Kusunoki Masashi of Citizen Energy Ikoma to come and speak about how his group put solar panels on the rooves of public buildings. see previous post about the talk. Japan is particularly vulnerable when it comes to energy disruption since it needs to import more than 80% of its energy requirements (if you want to know more in excruciating detail, see my master’s thesis on the topic). But the 2011 Fukushima disaster was a massive blow. The 9.0 Tōhoku earthquake caused a tsunami which triggered the nuclear meltdown causing nearly 16,000 deaths and hundreds of thousands of internally displaced people. Five years later, Japan is still heavily engaged in the cleanup. In the wake of the disaster, all 50 of Japan’s nuclear reactors were shut down. Starting last year, despite much public protest, the Abe Administration has begun restarting nuclear power plants. In the meantime there have been a number of citizen-led movements for safer, more resilient energy resources similar to Citizen Energy Ikoma. Many are inspired by the experience of Germany. As part of the Energiewende (“Energy Transition”), decentralizing and democratizing energy production has been a key effort. Municipalities and citizens have been taking back energy utilities and in 2012, one in sixty Germans was an energy producer. 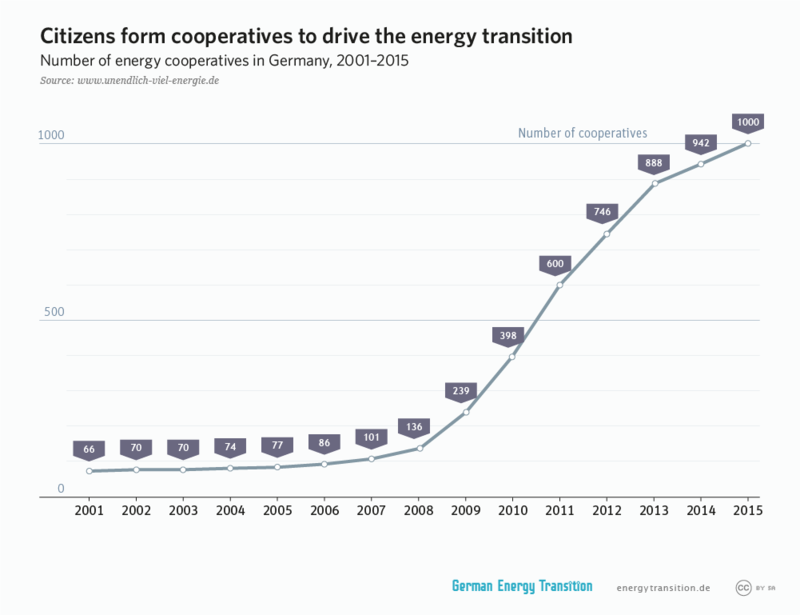 The number of energy coops has risen to over 1000 in 2015. Distributed energy supply, disaster-proofing resilient communities, and fighting climate change at the local level… it is all pretty inspiring stuff and makes me think about how this can be applied to my own city. Kelowna gets about 305 days of sun a year, with 1950 hours of bright sunshine. Plus it gets very little snowfall: only about 5 days a year with more than 5cm, and 1.4 days with more than 10. (data) What this means is that we have a lot of flat rooves. All that flat area and all that sunshine makes for a good argument for putting solar panels everywhere. Just this summer Kelowna City Hall replaced its roof. What if they had installed solar panels up there? Scratch that: what if we installed solar panels up there? How many other public buildings, schools and open areas could be used towards these ends? If the city does not have the capacity to do this, Ikoma and all the other cities in Japan and Germany prove that we as citizens can. They serve as examples of how to use our right to the city. On Sunday (18 Sep) we had a special guest give a talk about how citizens installed solar panels on public institutions in Ikoma City, Japan. Kusunoki Tadashi is a boardmember of Citizen Energy Ikoma (市民エネルギー生駒), a citizens group who took the fight against climate change into their own hands by leveraging public space to produce electricity locally. They put solar panels on the rooves of public buildings decreasing the local carbon footprint, and used the profits of the excess electricity sold back to the utility into other public projects. Mr Kusunoki spoke for about 30 minutes telling us about the groups story, its objectives and business model, and the status of the three projects that they have completed so far. Ikoma, a 200,000 person bedroom town between Osaka and Nara City, has a particularly eco-friendly history. It is aiming to be the most most energy efficient municipality in Japan. Citizen Energy Ikoma (CEI) was founded in 2013 and was the first in Nara Prefecture to execute such an energy initiative. They set out on this program with a few things in mind: First, they wanted the initiative to be citizen-funded. There was to be no money from government agencies or banks, and no corporate interests at play. They collected a lot of small contributions (in about $1000 increments) from private citizens. More than 70% of the contributions were from Ikoma locals. A second point was to involve retirees, to use “Silver Human Resources” (シルバー人材) as Mr Kusunoki put it. They wanted to empower retirees and show how they could give back to younger generations. CEI worked with the city and secured space on the roof of a building at a local water treatment plant. 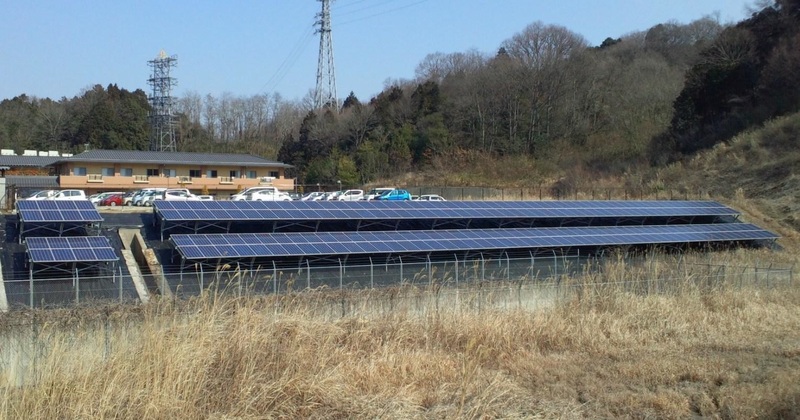 They installed 273 solar panels at the cost of 17M yen (about $220K CAD). The installation was completed in March of 2014 and produces about 50kW of electricity. The business plan was developed to extend over a 20 year period. The original citizen donors are able to get a small return (better than bank interest says Mr Kusunoki) on their $1000 investment. Profits from selling electricity back to the electricity utility go into new projects or programs. So far they have paid for signage at the children’s facility, power conditioners for the seniors home, and sponsored a number of environmental education initiatives including workshops for kids to learn how to make solar-powered cars and trains. The success of the first installation lead to the development of two more facilities. 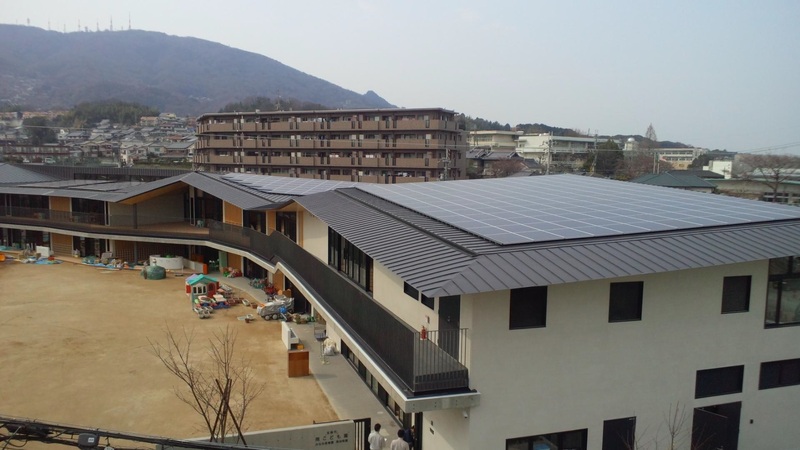 In 2015 a new children’s facility (南こども園) was being built, and CEI was able to install 297 panels on the roof. The roof of the Minami Kodomo-en covered in solar panels. CEI also installed 224 panels on an open bank behind a senior’s facility. Both of these installations can produce about 50kW each, bring the combined total of all three facilities to 150kW. This removes about 55,000 kilograms of CO2 out of the air, and saves on about 40,000 barrels of oil per year. Solar panels on a bank behind a seniors facility. The children’s facility was of particular interest to the CEI. It is an official Emergency Muster Point, meaning in the case of a disaster like an earthquake, it is deemed a safe place for people to retreat to. Having a ready-made energy supply at such a muster point is pragmatic strategy. Mr. Kusunoki said that the future is bright for the children of Ikoma. They are trying to make Ikoma a model and promote it as the best place to live in the Kansai region. Their goal is to show how empowered citizens can create safe, local energy and contribute to a more resilient distributed energy supply chain in the case of a natural disaster. In the future the CEI is looking at how these initiatives can turn into second careers for retired people. Furthermore, they are exploring more ways having for citizens become local energy producers. Mr Kusunoki delivers his lecture to local Japanese community.